Born in Christchurch, New Zealand, on 12 October 1929, Bernadette was the third daughter of an Irish-born immigrant father and New Zealand-born mother. She had two brothers and two sisters, one of whom, Madeleine, became a Sister of Mercy. From her birth in the month of the Rosary 1929 Bernadette was surrounded by Marian influences: she was born into a Marist parish, went to school with the Sisters of Our Lady of Mercy, and this influence continued right up until her death on Saturday 20 September 2014 at Mercy Parklands, a health facility of the Sisters of Mercy. Bernadette had frail health, and in recent months had grown progressively weaker. After two short stays in Auckland’s Middlemore Hospital she was transferred to Mercy Parklands Hospital for 24 hour care on Tuesday 16 September. With the constant companionship of smsm and her sister, Tess, Bernadette journeyed her final days in peace, frequently asking to sing the Samoan hymn: Fia alu i le lagi, (I long to go to heaven) expressing her yearning to be with Jesus and Mary. She had a tender love for Mary, whom she faithfully tried to imitate. Often in her last days she wanted to pray the Rosary, which she had always loved, and to which she whispered the responses with fading voice until her final breath. A visit by two smsm to her primary school when she was in Standard 6 inspired Bernadette to give herself to mission. She entered the novitiate at Heretaunga in 1948, and received the name of Sr Mary Grignion at her August reception. 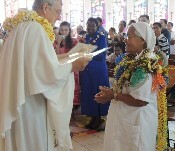 After her profession on 15 August 1950, Bernadette trained as a teacher for two years at Loreto Hall, Auckland, then was missioned to Samoa, arriving in Apia on the Tofua together with Sisters M. Kenny and Dominica on 2 January 1953. Final profession was in Leauva’a in 1956. 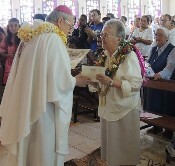 Between 1953 and 1989 Bernadette served at a number of mission stations in Western and American Samoa: Savalalo, Moamoa, Vaimoso, Leauva’a, Leulumoega, Falefa and Leone. Her ability to speak Samoan greatly helped her build relationships. As a teacher, her principal contribution was at the primary level. During her school years she was an athletics champion. Her interest and involvement in sporting activities continued in Samoa. 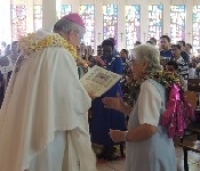 Together with Sr Mary de Paul she constructed home-made hurdles so that Vaimoso students could participate in this event. 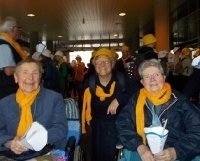 Girl Guides was another of her activities. Samoa is a great place for swimming – and Bernadette delighted in whatever opportunity offered. Back in New Zealand Bernadette was one of the four founding members of the ‘Ranui’ community in Whangarei in 1991. 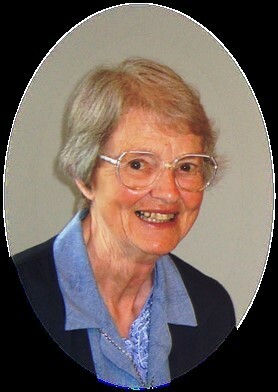 She became well known and much loved not only in the parish but also in Marian Heights Retirement Village and Selwyn Park Rest Home where she visited each week faithfully, taking communion to those who desired it and chatting with others who appreciated her company. When she transferred to Waikanae in 2006 she continued with similar pastoral activities. From 2009 Bernadette was a member of the Fairview Road community, Papatoetoe. 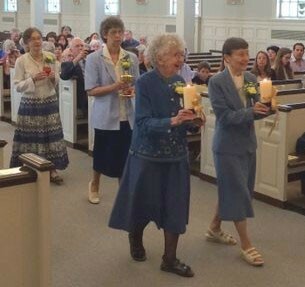 Although her physical energy was limited, Bernadette was interested in being present at parish activities, and she joined the St Vincent de Paul groups as a way of reaching out to those in need. Her beautiful smile and evident interest in persons made her a very welcoming person who mixed easily. At the vigil service, a number of parishioners and former students referred to this smile and her gentleness. She was intelligent and had a great sense of humour and loved to tell jokes – even if she often forgot the punch line. Bernadette knew herself, her weaknesses and her fragility. She accepted that at times she became over anxious, unchanging and even stubborn. A worrier throughout her whole life, at the end Bernadette was blessed with a peace and trust in God’s unconditional love. No more for her the fear, anxiety or alarm like that of the women at the tomb that Mark speaks of (16:1-8) and that we heard proclaimed during her vigil service. 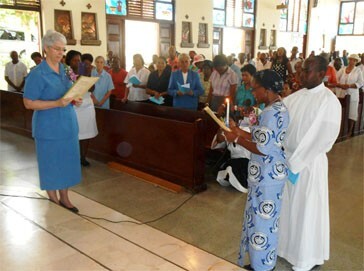 She loved the congregation and never failed to be interested in what was happening in the different countries where we serve. She was joyful, humble, and lived “hidden and unknown”. Bernadette always remained close to her family, knowing the names of all the nieces and nephews and subsequent generations and what they were doing. Ten of her sister Tess’s children came for her funeral at Holy Cross Parish in Papatoetoe, most flying up from Christchurch. Testimony indeed to their love for her. A passage from Paul’s second letter to Timothy was read at Bernadette’s requiem. With good reason Bernadette can say: “I have finished the race; I have kept the faith. Now there is laid up for me the crown of righteousness…” Yes, she has endured with Christ, and will also reign with him. Sr Bernadette is buried at Waikaraka Cemetery, Onehunga, alongside two smsm co-workers from Samoa: Sr Susana Vitolio and Sr Mary de Paul.